Archaea or Archaebacteria is a major division of living organisms, as well as the name of the members of this group, which in singular form are known as archaeon, archaeum, or archaean. Like bacteria, archaea are single-celled organisms lacking nuclei and are therefore prokaryotes. However, they differ significantly from bacteria, and therefore in recent classifications are generally separated from bacteria. In the three-domain system of biological classification, Archaea joins Eukaryota and Bacteria as the three domains, the top-level grouping of organisms. In the six-kingdom classification, the six top-level groupings (kingdoms) are Archaebacteria, Monera (the bacteria and cyanobacteria), Protista, Fungi, Plantae, and Animalia. In the traditional five-kingdom classification, developed in 1969 by Robert Whittaker and still popular today, the archaebacteria or archaea are placed together with other prokaryotes in the kingdom Monera. Archaea comes from the Greek αρχαία, meaning "ancient ones." These "living fossils" are genetically and metabolically very different from other organisms. One of the reasons Carl Woese introduced the three-domain taxonomic scheme in 1990 was to emphasize the separation of prokaryotes into two groups, the Bacteria and Archaea, because of the unique nature of the archaea. Archaea were originally described in extreme environments, but have since been found in many types of habitat. The enzymes isolated from some extremophile archaea have proven to be of great use in the biotechnology industry, able to function under conditions that would denature enzymes taken from most "normal" organisms. The name archaean has been used both for a single organism and as an adjective. 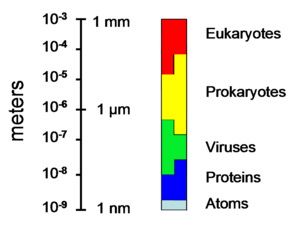 The sizes of prokaryotes relative to other organisms and biomolecules. Archea are single celled. They are prokaryotic, have no nucleus, and have one circular chromosome. Individual archaeans range from 0.1 μm to over 15 μm in diameter, and some form aggregates or filaments up to 200 μm in length. They occur in various shapes, such as spherical, rod-shape, spiral, lobed, or rectangular. Archaea have no murein in their cell walls. Recently, a species of flat, square archaean that lives in hypersaline pools has been discovered (Burns et al. 2004). Archaeans also exhibit a variety of different types of metabolism. Of note, the halobacteria can use light to produce ATP, although no archaea conduct photosynthesis with an electron transport chain, as occurs in other groups. Rather light-activated ion pumps like bacteriorhodopsin and halorhodopsin play a role in generating ion gradients, whose energy then leads to production of ATP. Archaea can reproduce using binary and multiple fission, fragmentation, and budding. Many archaeans are extremophiles (thrive in or require "extreme" conditions that would exceed optimal conditions for growth and reproduction in the majority of organisms). They can survive and thrive at even relatively high temperatures, often above 100°C, as found in geysers, black smokers, and oil wells. Others are found in very cold habitats or in highly-saline, acidic, or alkaline water. However, other archaeans are mesophiles (thrive at moderate temperatures) and have been found in environments like marshland, sewage, sea water, and soil. Many methanogenic archaea are found in the digestive tracts of animals such as ruminants, termites, and humans. Ecologically, methanogens play the vital role in anaerobic environments of removing excess hydrogen and fermentation products that have been produced by other forms of anaerobic respiration. No clear examples of archaean pathogens are known (Eckburg 2003, Cavicchioli et al. 2003), although a relationship has been proposed between the presence of some methanogens and human periodontal disease (Lepp 2004). Archeans live in Yellowstone geysers. Archaea are usually placed into three groups based on preferred habitat. These are the halophiles, methanogens, and thermophiles. Halophiles, sometimes known as Halobacterium live in extremely saline environments. Methanogens live in anaerobic environments and produce methane. These can be found in sediments or in the intestines of animals. Thermophiles live in places that have high temperatures, such as hot springs. These groups do not necessarily agree with molecular phylogenies, are not necessarily complete, nor are they mutually exclusive. Nonetheless, they are a useful starting point for more detailed studies. Recently, several studies have shown that archaea exist not only in mesophilic and thermophilic (and hyperthermophic) environments but are also present, sometimes in high numbers, at low temperatures as well. (Organisms that prefer cold environments are termed psychrophilic, those preferring moderate temperatures are termed mesophilic, those preferring warmer temperatures are termed thermophilic, and those thriving in extremely hot environments are hyperthermophilic.) It is increasingly becoming recognized that methanogens are commonly present in low-temperature environments such as cold sediments. Some studies have even suggested that at these temperatures the pathway by which methanogenesis occurs may change due to the thermodynamic constraints imposed by low temperatures. Perhaps even more significant are the large numbers of archaea found throughout most of the world's oceans, a predominantly cold environment (Giovannoni and Stingl 2005). These archaea, which belong to several deeply branching lineages unrelated to those previously known, can be present in extremely high numbers (up to 40 percent of the microbial biomass) although almost none have been isolated in pure culture (Giovannoni and Stingl 2005). Currently we have almost no information regarding the physiology of these organisms, meaning that their effects on global biogeochemical cycles remain unknown. One recent study has shown, however, that one group of marine crenarchaeota (taxa of Archaea) are capable of nitrification, a trait previously unknown among the archaea (Konneke et al. 2005). Archaea are similar to other prokaryotes in most aspects of cell structure and metabolism. However, their genetic transcription and translation—the two central processes in molecular biology—do not show many typical bacterial features, and are in many aspects similar to those of eukaryotes. For instance, archaean translation uses eukaryotic-like initiation and elongation factors, and their transcription involves TATA-binding proteins and TFIIB as in eukaryotes. Many archaeal tRNA and rRNA genes harbor unique archaeal introns, which are neither like eukaryotic introns, nor like bacterial (type I and type II) introns. The archaeal lipids are unique because the stereochemistry of the glycerol is the reverse of that found in bacteria and eukaryotes. This is strong evidence for a different biosynthetic pathway. Most bacteria and eukaryotes have membranes composed mainly of glycerol-ester lipids, whereas archaea have membranes composed of glycerol-ether lipids. Even when bacteria have ether-linked lipids, the stereochemistry of the glycerol is the bacterial form. These differences may be an adaptation on the part of Archaea to hyperthermophily. However, it is worth noting that even mesophilic archaea have ether-linked lipids. Archaeal lipids are based upon the isoprenoid sidechain. This is a five-carbon unit that is also common in rubber and as a component of some vitamins common in bacteria and eukaryotes. However, only the archaea incorporate these compounds into their cellular lipids, frequently as C-20 (four monomers) or C-40 (eight monomers) side-chains. In some archaea, the C-40 isoprenoid side-chain is actually long enough to span the membrane, forming a monolayer for a cell membrane with glycerol phosphate moieties on both ends. Although dramatic, this adaptation is most common in the extremely thermophilic archaea. Although not unique, the archaeal cell walls are also unusual. For instance, the cell walls of most archaea are formed by surface-layer proteins or an S-layer. S-layers are common in bacteria, where they serve as the sole cell-wall component in some organisms (like the Planctomyces) or an outer layer in many organisms with peptidoglycan. With the exception of one group of methanogens, archaea lack a peptidoglycan wall (and in the case of the exception, the peptidoglycan is very different from the type found in bacteria). Archaeans also have flagella that are notably different in composition and development from the superficially similar flagella of bacteria. Bacterial flagella is a modified type III secretion system, while archeal flagella resemble type IV pilli, which use a sec dependent secretion system somewhat similar to but different from type II secretion system. The biological term, Archaea, should not be confused with the geologic phrase Archean eon, also known as the Archeozoic era. This latter term refers to the primordial period of Earth history when Archaea and Bacteria were the only cellular organisms living on the planet. Probable fossils of these microbes have been dated to almost 3.8 billion years ago. Their remains have been found in sediment from western Greenland, the oldest sediment to be discovered (3800 million years ago) (Hahn and Haug 1986, Chappe et al. 1982). Archaea were identified in 1977 by Carl Woese and George E. Fox as being a separate branch based on their separation from other prokaryotes on 16S rRNA phylogenetic trees (Woese and Fox 1977) These two groups were originally named the Archaebacteria and Eubacteria, treated as kingdoms or subkingdoms, which Woese and Fox termed Urkingdoms. Woese argued that they represented fundamentally different branches of living things. He later renamed the groups Archaea and Bacteria to emphasize this, and argued that together with Eukarya they compose three Domains of living organisms (Woese et al. 1990). 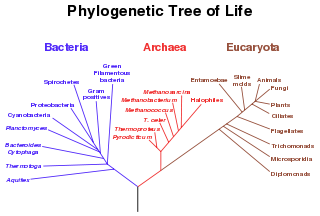 Archaea are divided into two main taxonomic groups, the Euryarchaeota and Crenarchaeota, based on descent trees for ribosomal RNA. Two other groups have been tentatively created for certain environmental samples and the peculiar species Nanoarchaeum equitans, discovered in 2002 by Karl Stetter, but their affinities are uncertain (Huber et al. 2002). Woese argued that the bacteria, archaea, and eukaryotes each represent a primary line of descent that diverged early on from an ancestral progenote with poorly-developed genetic machinery. This hypothesis is reflected in the name Archaea, from the Greek archae or ancient. Later, he treated these groups formally as domains, each comprising several kingdoms. This division has become very popular, although the idea of the progenote itself is not generally supported. Some biologists, however, have argued that the archaebacteria and eukaryotes arose from specialized eubacteria. The relationship between Archaea and Eukarya remains an important problem. Aside from the similarities noted above, many genetic trees group the two together. Some place eukaryotes closer to Eurarchaeota than Crenarchaeota are, although the membrane chemistry suggests otherwise. However, the discovery of archaean-like genes in certain bacteria, such as Thermotoga, makes their relationship difficult to determine, as horizontal gene transfer may have occurred (Nelson et al. 1999). Some have suggested that eukaryotes arose through fusion of an archaean and eubacterium, which became the nucleus and cytoplasm, which accounts for various genetic similarities; however, this explanation runs into difficulties in trying to explain cell structure (Lake 1988). Burns, D. G., H. M. Camakaris, P. H. Janssen, and M. L. Dyall-Smith. 2004. Cultivation of Walsby's square haloarchaeon. FEMS Microbiol Lett. 238(2): 469-473. Cavicchioli, R., P. Curmi, N. Saunders, and T. Thomas. 2003. Pathogenic archaea: do they exist? Bioessays 25(11): 1119-1128. Chappe, B., P. Albrecht, and W. Michaelis. 1982. Polar lipids of archaebacteria in sediments and petroleums. Science 217(4554): 65-66. Giovannoni, S. J., and U. Stingl. 2005. Molecular diversity and ecology of microbial plankton. Nature 427(7057): 343-348. Hahn, J., and P. Haug. 1986. Traces of archaebacteria in ancient sediments. System Appl Microbiol 7: 178-183. Howland, J. L. 2000. The Surprising Archaea: Discovering Another Domain of Life. Oxford: Oxford University Press. ISBN 0195111834. Huber, H., M. J. Hohn, R. Rachel, T. Fuchs, V. C. Wimmer, and K. O. Stetter. 2002. A new phylum of Archaea represented by a nanosized hyperthermophilic symbiont. Nature 417(6884): 27–8. Konneke, M., A. E. Bernhard, J. R. de la Torre, C. B. Walker, J. B. Waterbury, and D. A. Stahl. 2005. Isolation of an autotrophic ammonia-oxidizing marine archaeon. Nature 437(7057): 543-546. Lake, J. A. 1988. Origin of the eukaryotic nucleus determined by rate-invariant analysis of rRNA sequences. Nature 331(6152): 184-186. Lepp, P., M. Brinig, C. Ouverney, K. Palm, G. Armitage, and D. Relman. 2004. Methanogenic Archaea and human periodontal disease. Proc Natl Acad Sci U S A 101(16): 6176-6181. Nelson, K. E., et al. 1999. Evidence for lateral gene transfer between Archaea and bacteria from genome sequence of Thermotoga maritima. Nature 399(6734): 323-329. Woese, C. R., and G. Fox. 1977. Phylogenetic structure of the prokaryotic domain: the primary kingdoms. Proc Natl Acad Sci U S A 74(11): 5088–5090. Woese, C. R., O. Kandler, and M. L. Wheelis. 1990. Towards a natural system of organisms: Proposal for the domains Archaea, Bacteria, and Eucarya. Proceedings of the National Academy of Sciences 12(87): 4576–4579. This page was last modified on 29 August 2008, at 13:10.